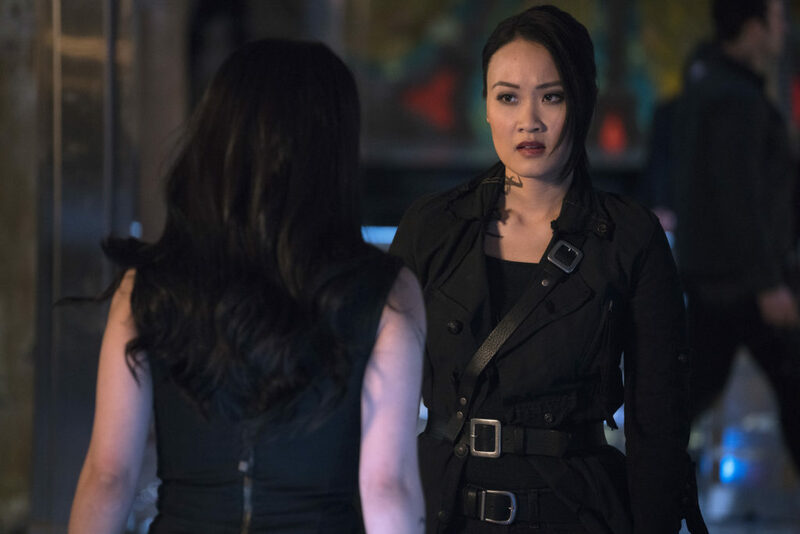 In this week’s Shadowhunters, we meet Aline Penhallow, discover the real identity of the Sebastian imposter, Simon gets into some hot water after his breakup with Clary, Valentine almost gets sent to Idris, and Alec and Magnus get honest. Sebastian’s (Will Tudor) mother was Aline’s father’s younger sister. However, both his parents died and he was raised by his paternal aunt, Elodie Verlac. Aline (Eileen Li) in the meantime was the only child of Jia and Patrick Penhallow, who had been heads of the Beijing Institute for a time before moving to Alicante. In tonight’s episode, she appears at the New York Institute and is warmly greeted by Alec (Matthew Daddario) and Isabelle (Emeraude Toubia). 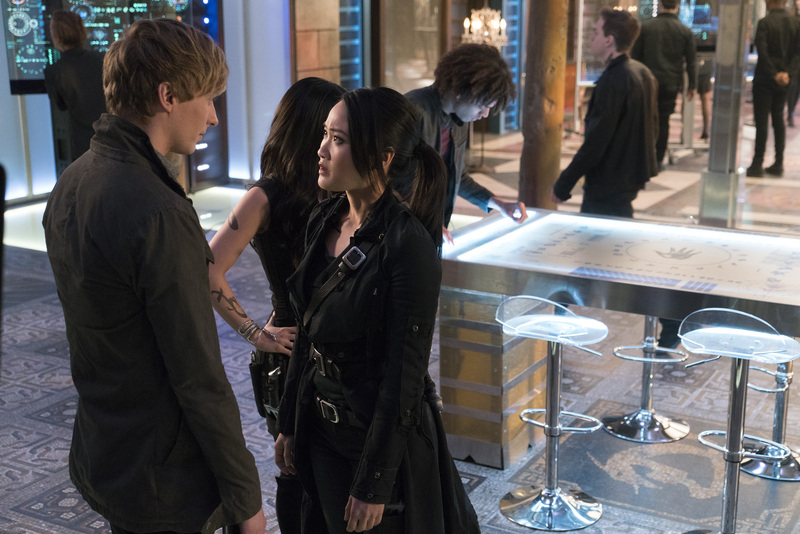 The siblings seem to have known her for many years, which goes along with the books where Aline was childhood friends with both Lightwood siblings. She explains that she would have told them in advanced that she was coming but didn’t want to spook her cousin Sebastian. He apparently disappeared for half a year without a word. Obviously he’s taken by surprise because well, he’s not the real Sebastian! Aline’s sternness is just for a moment though as she quickly gives him a big hug. The other Shadowhunter tells him that his Aunt Elodie has been sick with worry and that they had thought he was dead. When they heard that he was in New York but still hadn’t called, his aunt sent her over to check on him. His cousin asks if he is really a yin fen addict and he uses this to his advantage by looking uncomfortable. Izzy comes to his rescue by saying that he’s clean now. Sebastian then adds that he felt terrible and knew he should have called but was too ashamed. Sensing something else, Aline comments that there is something different about him. Izzy though jumps in again and tells her about how he saved her life and helped them defeat a greater demon. 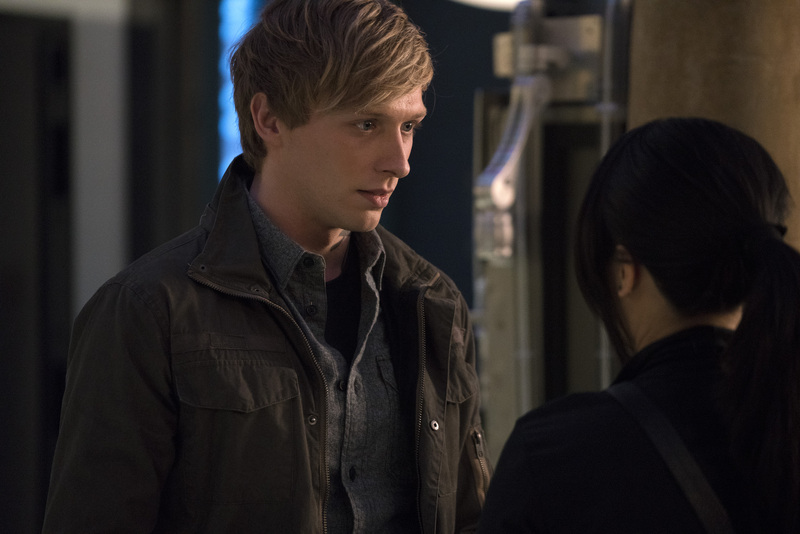 Will Tudor does bashful adorably fyi. Sebastian then says that he’ll fill her in on all the gory details over dinner. He then runs back to his apartment to make the real Mr. Verlac tell him everything about Aline Penhallow. Awhile later when the two “cousins” are on their way to dinner, she tells him that she’s still really worried because he’s the most rule-abiding person she knows and his sudden disappearance just doesn’t add up. He explains though that he’s happier than he’s ever been and that he’s not proud of what he’s done but thinks that she of all people should understand. Aline asks why and he recalls when he went to Alicante and she was secretly seeing a girl named Carolyn. Everyone apparently just believe that she hadn’t found the right boy, revealing that Aline is attracted to women. Sebastian goes on to say that she should know how it feels to seen as one way and being the exact opposite on the inside. He admits that he likes to take risks and that the yin fen was a mistake but it led him to his destiny here. The guy then cleverly maneuvers a way to get rid of his cousin by explaining that he had spoken to Elodie Verlac who sounded heartbroken and if she could spend a few days with her to make sure his aunt would be ok. Aline, taken in by the moment agrees without hesitation and says that she can leave tonight. He does tell her that she shouldn’t leave until they have dinner at an Indian place nearby, which is her favorite cuisine. Meanwhile, the real Sebastian manages to free himself from his bindings, now worried for his cousin’s life. Sadly though, the pretend version of him catches up and stabs him in the back just as he makes it onto the grounds of the Institute where Aline is bidding Izzy farewell as she leaves for London. 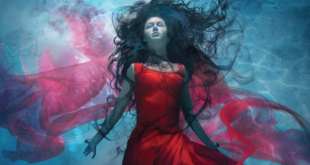 WARNING: The Mortal Instruments and The Dark Artifices Series SPOILERS AHEAD. We first met Aline in City of Glass when the Penhallows were housing the Lightwoods and Sebastian in Alicante. They were visiting Idris for the signing of the Tenth Accords. During this time she had kissed Jace in an attempt to see if she could be attracted to men and had been interrupted by Clary. When demons attacked the city she was knocked unconscious and almost raped, but thankfully Isabelle was able to prevent that from happening. In the same night, Sebastian killed Max Lightwood and in disbelief she contacted his Aunt Elodie who then sent over some of his belongings and pictures of him. Aline then realizes that the Shadowhunter she knew as her cousin was an imposter and tells Clary. She also explains that she didn’t have feelings for Jace. After the Mortal War, her mother Jia was appointed the new Consul and she was able to come out to her parents as being lesbian. She begins to date Helen Blackthorn, a Shadowhunter who was half Nephilim and half fairy. During the Dark War, Aline was in Alicante with Helen and helped take care of the younger Blackthorn children: Julian, Tiberius, Livia, Drusilla, and Octavian as well as Emma Carstairs who were all orphaned after Sebastian’s attack on the Los Angeles Institute. However, after Valentine’s son was defeated the Clave voted to send Helen to Wrangel Island to study the wards. She followed a year later and eventually Helen proposed to her. They were married in Idris after the eldest Blackthorn sibling agreed to go to the Shadowhunter Academy and tell the story of her parents and serve as an example of the Clave’s distrust of fairies as a temporary pardon. Some years later during the events in Lord of Shadows, Aline and Helen were called to Alicante to give testimony on the wards after Diana Wrayburn tells Jia about the blight in Brocelind Forest that was likely done by the Unseelie King. They were present during the interrogation of Annabel Blackthorn through the Mortal Sword and her subsequent breakdown from the mental stress. Diana had hoped that Aline could take over running the Los Angeles Institute so that Helen could be with her family again but that is very much up in the air. Shadowhunter Zara Dearborn and her father wanted the position for themselves in order to be able to introduce a law to the Council that would require Downworlders to be listed in a registry. This was their attempt to control vampires, werewolves, warlocks, and fairies under their authoritarian rule. Currently Aline and Helen’s fates are unknown given the growing problems in the shadow world. We’ll certainly find out more in the third book in The Dark Artifices series, Queen of Air and Darkness. 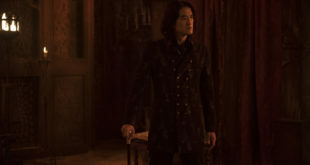 Her appearance on the Shadowhunters though is a welcomed one, not only because we found out truly who Sebastian was (he revealed himself as the burned demon-blooded son of Valentine Morgenstern after he had Duncan portal the Circle leader to an unknown location) but also because it’s great to have more diverse representation on the show. 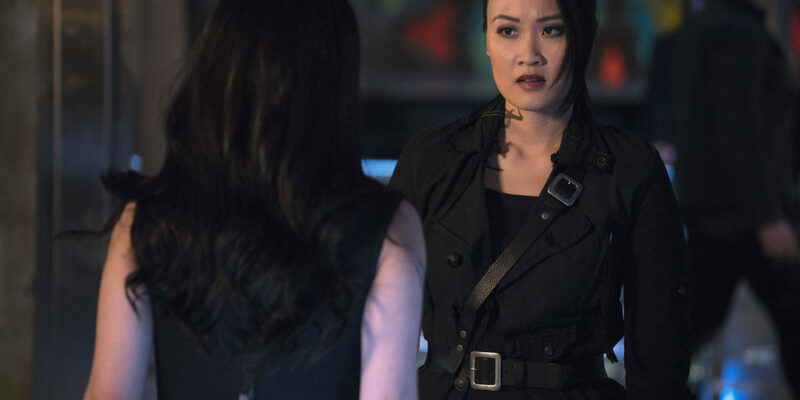 To have a Shadowhunter who is Asian (she is half-Asian in the books), female, and lesbian is important to present a wide array of characters inhabiting the world going through situations that many people face in real life. Here’s hoping this isn’t the last we see of her!